With a legacy that stretches all the way back to the early 1950s, through the "Fintail" decade of the '60s, and all the way up to today's climate of advanced luxury automobiles, the Mercedes E Class has remained one of the German automaker's most visible offerings. By the mid-1970s, the E Class grew into its role as a midsize luxury sedan with a reputation for efficient performance. Overall sales numbers reflected this, as the car became a hot seller. Eventually, the E Class made its debut in the U.S. as a sedan, coupe, convertible, and wagon in the early '90s. The 300E (inline-six cylinder) 300D (turbodiesel) served as the entry-level models, while the V8-equipped 400E and 500E (later the E420 and E500, respectively) featured refined engine configurations. Second-generation versions of the E Class made their way into showrooms for the 1996 model year. Slightly longer, the E Class also featured elliptical headlights which have gone on to be a recognized attribute of modern Mercedes models. Offered in the lineup were the E300D and the E320, with the latter being outfitted with an inline six-cylinder engine good for 217 HP. The bolder E420 came with a 275-HP, 4.2L V8 engine. In 1998, 4Matic all-wheel drive returned to the lineup as an option. A 3.2L SOHC V6 replaced the previous inline-six cylinder inside the E320, the station wagon was brought back, and the diesel engine got a boost up to around 180 HP - these were the other major changes to E Class parts for that model year. In 1999, the E55 AMG was launched. It was powered by a 349-HP V8 engine. The E420 became the E430, as the engine was given a slight increase up to 4.3L. Over the next couple of years, only a few changes were made to Mercedes E Class parts, the most notable of which being the discontinuation of the diesel (2000). The third generation of the Mercedes E Class rolled off the line for 2003. When it premiered, the entry-level E320 displayed a 3.2L V6 (221 HP). The E500 was powered by a 302-HP, 5.0L V8 24-valve engine and featured new electronic brakes and an adaptive suspension. In 2004, a new variant of the wagon (the E55) saw the world, while 4Matic all-wheel drive was dramatically upgraded. The E55 came with a supercharged 5.4L V8 produced up to 470 HP. In 2005, Mercedes once again offered a diesel E Class trim, the E320 CDI. 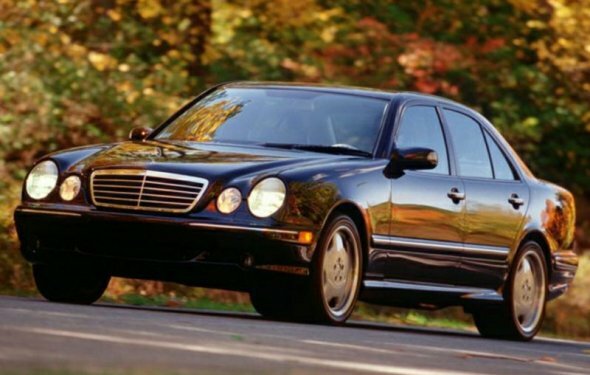 Later that year, the E320 was renamed the E350 and equipped with a 270 HP, 3.5L V6 engine. The E Class was completely redesigned for the 2007 model year. The E500 was discontinued. The E550 powered by a 382 HP V8 engine was launched. The E63 AMG replaced the E55 version. Every once in a while there is a car that is both well-performing and also a status symbol. The Mercedes E Class fits that description well. With elegant beauty and a refined, sophisticated approach, the Mercedes E Class makes no mistake about its intentions on the road. It oozes with comfort on the inside, breaks hearts on the outside, and rides with a consistent level of smoothness that stands up to all of its competition. Truly a unique luxury car all the way around worth of luxurious accessories and parts. CARiD's job is to put our drivers in touch with Mercedes E Class Accessories and Parts that deliver the effect they're going for. Whether you're after sporty luxury, sizzling style, or improved protection, our inventory of Mercedes E Class accessories and parts covers all the bases. Choose from a long line including chrome trim, spoilers, floor mats, wheels, grille guards, and more. Plus, all of our Mercedes E Class accessories come from the world's most respected names to guarantee the highest level of quality possible. Intrigued? Click on your Model Year above to discover the possibilities today!